Investing in the housing market might have you looking at homebuilder stocks today. Here's why NVR and LGI Homes are the best of the bunch. If you look around, you may notice that the housing market looks pretty strong right now. Housing starts are up to 1.35 million, the inventory of houses for sale is hovering around all-time lows, and home prices are incredibly attractive for those looking to sell. Toss in the fact that millennials are entering the housing market in droves to buy their first home, and it would be completely reasonable to think that buying homebuilder stocks would be a great idea. The seed for a great investment idea is there, but there is one issue: Homebuilding is a crappy business. It's incredibly capital-intense, margins aren't that great, turnover of inventory is relatively slow, there aren't a lot of ways for companies to differentiate themselves, it's cyclical, and it's fragmented. For a company to be a good investment in this business, it needs to have an exceptionally good management team, economies of scale, and a significant advantage over others in a unique way. This isn't to say that investing in homebuilding is an awful idea -- the trends mentioned above are incredibly strong indicators that investing in housing can pay off. What matters is you have to be incredibly discerning when selecting the business in which you want to invest. To me, there are only two stocks that are really worth exploring as potential investments: LGI Homes (NASDAQ:LGIH) and NVR Inc. (NYSE:NVR). Here's why these two homebuilders stand out among the crowd. Image source: NVHomes, a division of NVR. Instead of sweating the more speculative aspects of the business, NVR agrees to land purchase agreements with land developers. Think of it as a futures contract: NVR pays a small amount of cash to a developer up front, which gives it the right to purchase completed lots at deep discounts. This drastically reduces the amount of capital the company needs to commit to a development before it can start to recognize revenue, and the company doesn't have to take on an immense amount of speculative risk or leverage. 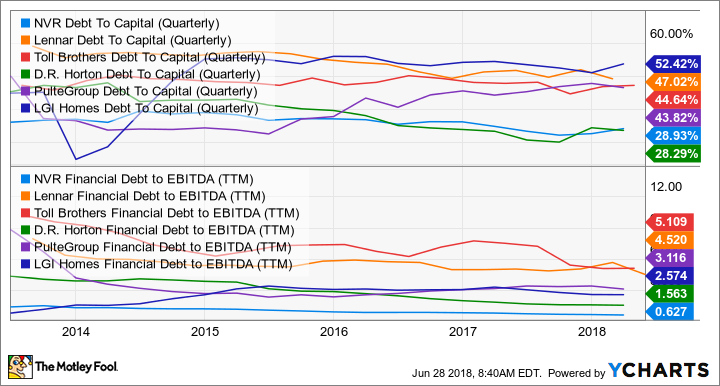 NVR Debt To Capital (Quarterly) data by YCharts. Another attractive aspect of NVR's business model is that it focuses on performing exceptionally well in its limited geographic markets rather than have operations thinly spread across the country. By concentrating its efforts into the Mid-Atlantic and Great Lakes region, it can squeeze out operational efficiencies and generate the highest rates of return in the business. By remaining a regional player, it also means the company generates excess cash, which management uses to buy back stock at a high rate. 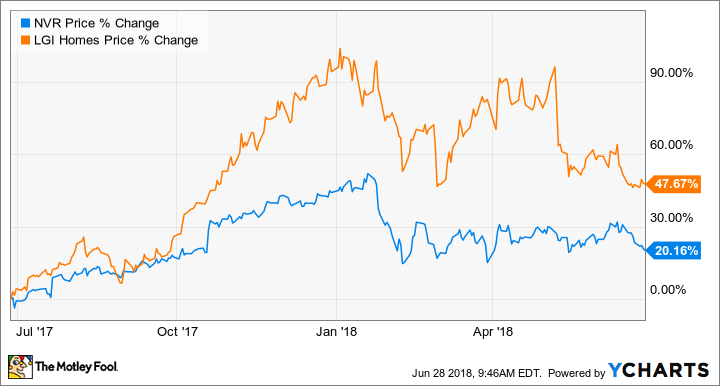 If there is one thing that concerns me about NVR, it's that management may be a little too generous with its stock grants such that it impacts shareholder returns. A lot of NVR's value creation comes from a consistently lower share count, but stock grants to management have more than offset share repurchases over the past 18 months. If that issue is just a short-term blip, then NVR looks like a great investment. I'm overgeneralizing a little bit, but most new homes can be lumped into three distinct categories: starter homes, move-ups, and luxury. Most homebuilders will have a blend of these homes in their inventory, a few will focus on the luxury market, but LGI Homes focuses pretty much exclusively on the starter home market and has built its business to specifically cater to the demographics of these customers. LGI is much more of a no-thrills builder than its peers. It doesn't offer several premium package options like kitchen or bathroom upgrades or several different architectural designs. Instead, it focuses on a few more cookie-cutter designs that can be built relatively quickly and keep costs down such that LGI can sell more affordable homes. The company also targets land purchases, lot purchases, or lot agreement contracts in places that are away from metro areas but have easy access to highways and are close to retail and employment centers. This buying strategy is also a way to provide a lower price point on entry homes. Management also uses a more targeted marketing approach to reach its buyer demographic. It specifically seeks out first-time buyers and renters with its marketing campaigns that offer move-in ready homes that don't require a down payment and offers them at comparable rates to rentals in the area with the possibility of building equity. It has been an incredibly successful tactic, as new homes sold has increased 10 times over the past decade. LGI isn't without flaws. It carries a rather high debt load compared to its peers, and targeting buyers with no down payment might give some investors the chills because of potentially questionable customer creditworthiness. These two things suggest that if we were to see a housing market swoon, LGI Homes could be one of the first to suffer.